Me Francisco René, the Chief Prosecutor of Port-de-Paix, has been appointed as the Prosecutor of Port-au-Prince and the 9th Commissioner in the President Martelly Government since it came to power. He replaced Me Lucmane Delille, who held this office since October 30, 2012. Me Delille, the former commissioner of Port-au-Prince, has been transferred to the Ministry of Justice. 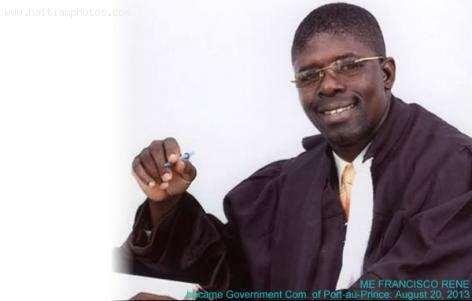 The appointment of Me Francisco René as the new Prosecutor of Port-au-Prince was confirmed by the Minister of Justice, Jean Renel Sanon, on August 19, 2013. Me Francisco René, as the former Chief Prosecutor of Port-au-Prince, has left behind a mixed record of several unsolved political and judicial scandals. Although Mr. Rene is already a reputed leader of ASMAH, an association of pro-government judges, his appointment as the Prosecutor of Port-au-Prince came amidst stern condemnation and protest even before he took charges as the Ninth Commissioner of the Government. The minister Sanon extended his support for the appointment of Me René as the new Prosecutor of Port-au-Prince and argued that the transfer of Me Lucmane Delille in the Ministry of Justice was a routine transfer and it was very much desired because the country will be benefited with his additional responsibility and we can utilize more of his expertise for developing better coordination among different Prosecutor's offices of the state. The new appointment of Me Francisco René was categorically opposed by Me Carlos Hercules, the President of the Federation of Law Societies of Haiti (FBH). He said, "It is a known fact within the country that Me René is another name of corruption, wherever he goes controversy follows."